I think its worth noting, that atleast in the case of the Sancho scabbard there are tooled incised lines near the suspension. And on the de la Cerda it seems there may be incised lines running down the length if I am not mistaken. Indeed, there are signs of both risers and tooling before or during the period I focused on in my posts, and I hope I didn't say anything entirely to the contrary. My point was that historical finds that incorporate either risers or tooling as more than an afterthought are few and far between. This is in contrast to modern scabbards, which more often than not have an overabundant use of both. Prior to the later Medieval period, these were very subtle methods of decoration; virtually none survive that justify their liberal use in modern reproductions. Ar you sure that's not the same gilt fittings over white leather rather than red or black? Maybe I'm not understaning this correctly. Is the scabbard covered in decorated parchment painted, without this being specified? Does the green and red silk only cover part of the mouth, or is it not the covering on the entire scabbard, thus being the patterning shown? The Setvans effigy is another fine example of what might be patterned textile (silk velevet?) covering rather than incised leather. 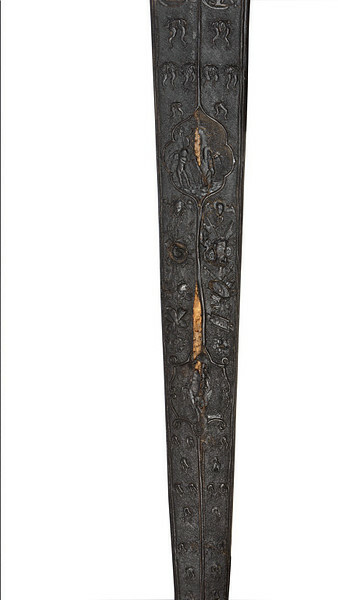 This scabbard is currently at display at the Rothenburger Reichsstadtmuseum. I unfortunately don't know it's origin and age for sure, but I guess the plaque maybe associated with it, so it would be from the 14th century. This is the most beautiful example of ornamented scabbard mount I've seen so far. Amazing. More pictures would be welcome! I do only have this one picture, back then I concentrated more on the swords. However, I can send you a version in higher resolution, if you like. Feel free to pm me. 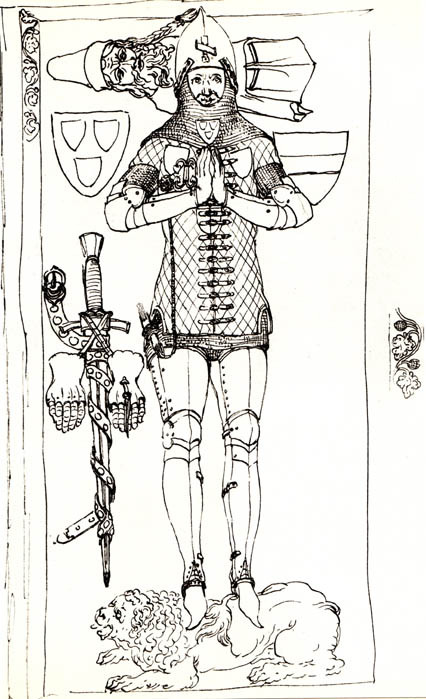 Based on the description and the sketches, it appears that the entire scabbard's face is covered in parchment which then has the leaf designs painted onto it. The green and red silk is just at the mouth of the scabbard. I'm not entirely sure if the author was aware of how the silk was attached, but it seems to just go right between the scabbard and the baldric components. The main reason I'm quite sure of the parchment's coverage is because the bottom of the image shows the degraded materials. The parchment is shriveled up and certainly a whole piece, rather than being cut and patterned around the silk, for example. They never cease to impress me. I'm curious to know some more specific dates and where they are located. So I'm guessing that parchment is pretty durable stuff? What sorts of paint would they have used 1000-1300 and how durable would it have been? Is there evidence of enameling during this time being applied to scabbards? Medieval parchment was very durable stuff. In its basic form it was essentially rawhide from sheep, shaved very thin for use as manuscripts or other less typical applications, such as covering scabbards. The survival of so many tens of thousands of manuscripts from so far north in Europe, such as in England, is a testament to its natural strength as a material. It's far more durable than paper. During the High Middle Ages, pigments were almost always derived from natural materials that could be crushed or squeezed to produce colors that were generally earthy, but often very rich and bright. Most manuscripts we see reproduced in photos or even have opportunities to glimpse in museums will be dulled out compared to their original coloration and texture - over the years pigments and binders have faded to dust, effectively removing us (generally) from experiencing Medieval paints, inks and dyes in their original glory. Here's a nifty page that summarizes some of the basic concepts, including the use of binders. For the purposes of scabbard making and binding to parchment or leather, I imagine that very thinned out hide glue with a mix of egg would not be an unreasonable mixture to add pigments to to create paint. I know that that was apparently a popular mixture for shield painting, where rawhide was commonly used as a facing. I have evidence at hand for only one scabbard decorated with enamel. Below is a ceremonial sword attributed to Frederick II, c. 1220. 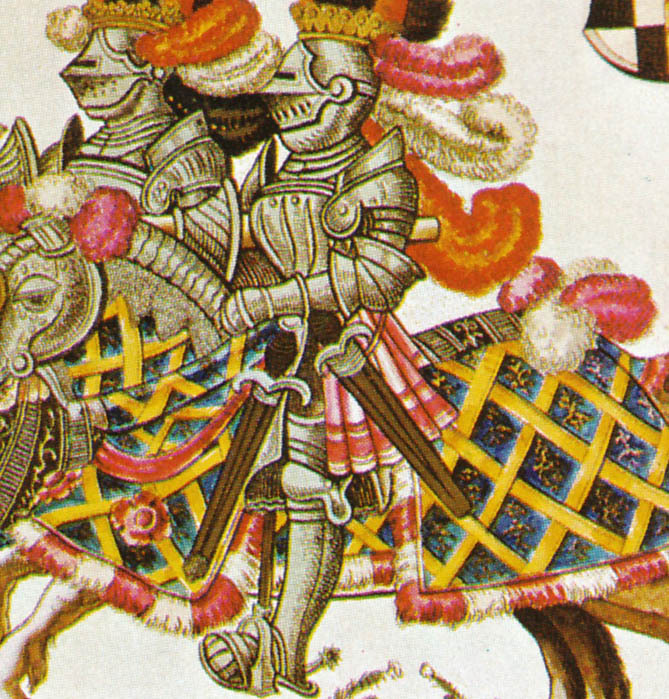 A description in Swords and Hilt Weapons by Anthony North, written on page 35, says "The hilt and scabbard mounts are of gold, decorated with pearls and enamel." Enamel was also popular with other forms of art, reinforcing the possibility of its use on less fancy scabbards than those of Emperors'. Bronze or gilt/silvered items of high quality could be enameled with terrific results. I think that Leo from Tod's Stuff actually just finished reproducing a beautiful enameled candlestick from around 1200. It seems that enamel, as a substitute for paint, was sometimes used to decorate stone sculptures - tomb effigies come to mind as a prime example. Some more, all from Paul Martin's Arms and Armour (a well-illustrated book that gets little press). 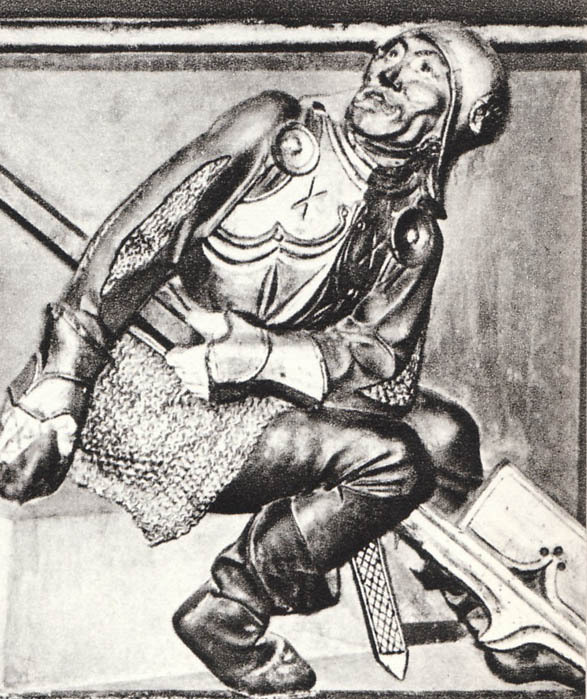 Archer from 1350-1355. St. Nicholas Church, Haguenau. Mathis Nithardt altarpiece - Unterlinden Museum Colmar. Late 14th century? Looks later in style. More, all from the same source. Though I have been more interested in tooling than in risers/longitudinal lines, risers were brought up, so here here we are with many of these. It's hard to know if these lines are risers or something else, but they are compelling. 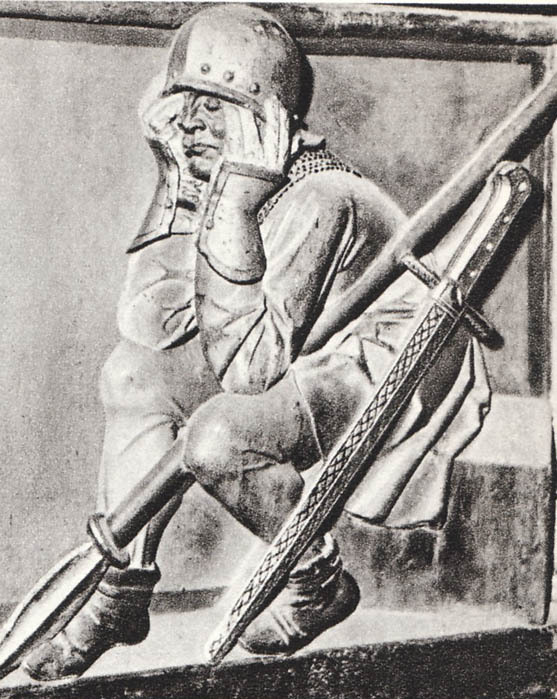 (Drawing of) Scabbard from the sword of the Constable of France, late 15th century. 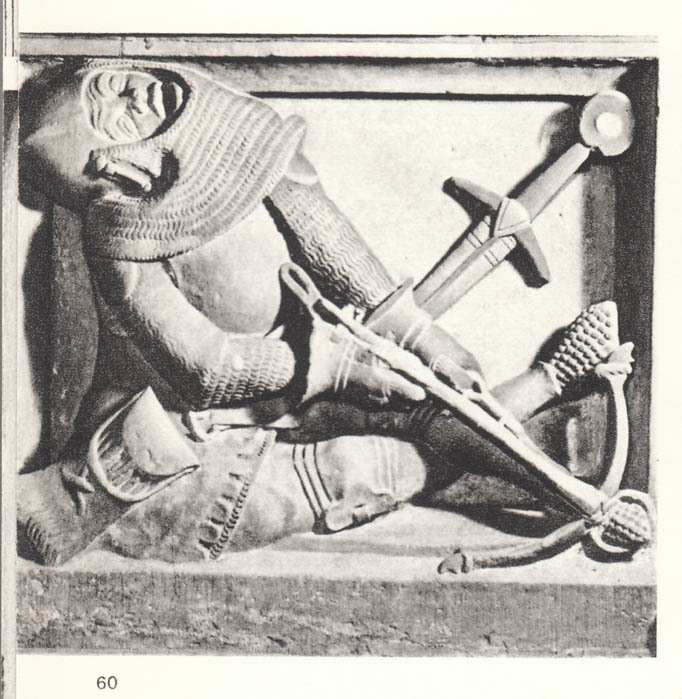 One of the guardians of the Holy Sepulchre, Obernai Church late 15th-early16 c.
Another of the guardians of the Holy Sepulchre, Obernai Church late 15th-early16 c.
William IV Book of Tournaments, first quarter of 16th century. 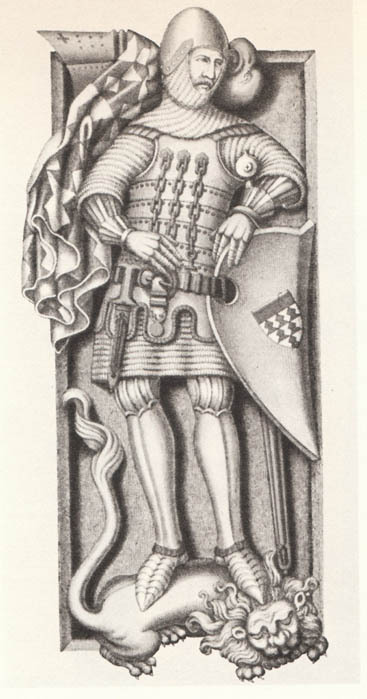 Some are quick to dismiss elaborate designs like on the Fitzralph scabbard as embroidery or painting rather than tooling. I'm skeptical of that. Knife scabbards of the era were tooled extensively. I find it hard to believe that people wouldn't have applied the kind and methods of decoration seen on knife scabbards to sword scabbards, though I'll admit my notion is hardly proof of anything. For Gregory, here's historically correct tooling, decorated with paint, from a knife scabbard I have. Fittingly, some of the brown dye has bled through the white paint, creating an off-white I actually find appealing. I think period paint would have been more likely to fade and bleed through than modern paints. I wonder whether there's any information to indicate if the risers running the length of the earlier scabbards you posted (seem mainly to be late 14th century) might have been made of wood? It would certainly support the structural integrity of the thin slats of wood used to form the sheath, and be a light alternative to using thicker slats. 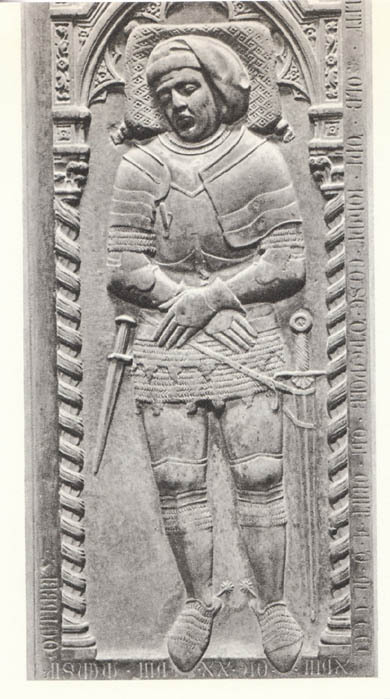 I still hesitate to suggest that such tooling was common on pre-14th century scabbards. Those that survive do not exhibit such tooling and the artwork more scarcely shows decoration as well. Certainly, the art we have available from the early 14th century forward that shows details on scabbards is likely to be tooling/painting of the sort used for knife scabbards. We have enough extant decorated scabbards to correlate this; at least by the late 14th century, by which time it must have been a more common practice (since we still have some) that had spread over time. It seems like most trends we pick up in the evidence would last at least a few decades. This is less true of the form of fashion than of the processes used by artisans, which took years to master and teach to others. Due to the crawling spread of ideas, 'innovation' tended to echo more prominently than nowadays and technology was slow to be replaced. Such methods of decoration are, after all, Medieval technology, as little as we may generally observe it as such. It's Tod (Leo). I've looked at Gaukler's stuff and have been mighty tempted. Got it and love it. I used it to commission the knife pictured above. I wish it had actual photos instead of line drawings, though. looks like most of the Mary Rose sheaths and scabbards had tooled decoration ranging from a few simple lines to extensive wiggle-work, punching, etc. one sword scabbard has an elaborate boxwood pommander attached by a silk tassle. I am totally with you in that I believe that many of the designs being chosen and executed on high-end modern scabbards are not especially consistent with historic elements of design and aesthetics. However, I am not sure if I understand why you seem to be saying that extensive tooling on leather in modern pieces representing the period 1000-1300 may not be a good design choice. We see tooling on leather of Anglo-Saxon seax sheaths on extant pieces. We see extensive tooling on pieces post 1300. We also see artistic representations of designs on scabbards of the period which could be tooling. I do agree that modern scabbard makers may want to incorporate more parchment, and fabric covered scabbards. 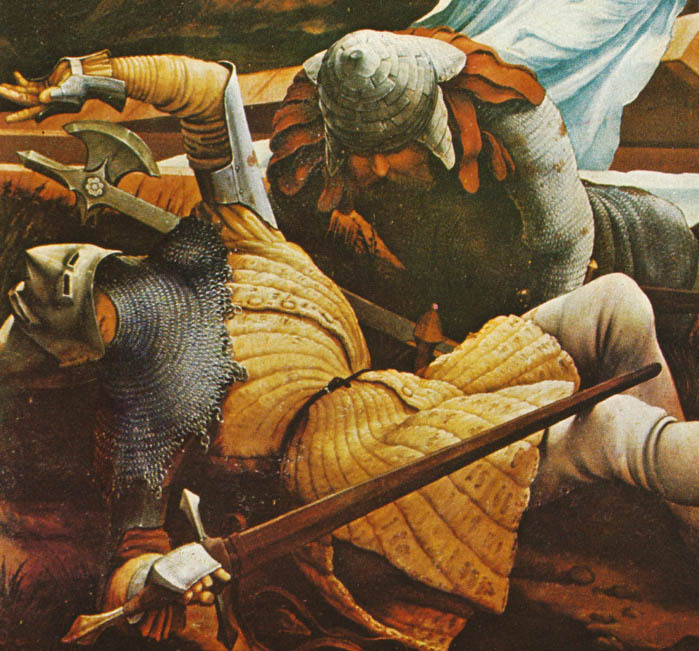 I also agree that we could stand to see more paint on pieces aimed at historical accuracy. Just to clarify, I'm really interested in 1000-1500 AD +/- a bit and made this thread with that in mind. That's what we've been discussing, but I wanted to be clear before someone starts in with Migration scabbards, Roman scabbards, or smallsword stuff. There certainly existed the means and ability for some rather elaborate tooling to be done on scabbards. Personally, I would guess that how a scabbard was decorated really depended more on the tastes of the owner than some overall cultural trend. With the status symbol of the sword and the expectations of being a higher class, a scabbard would seem to be something that could really highlight those things. And I would also expect that a wide range of technologies would be used to decorate that. Now if current scabbards reflect historic ones, well lacking a time machine it's hard to say. I'd certainly concede that modern aesthetics play a role, but I'd guess that they'd be taken as the preferences of the owner than something unheard of.